Gloria Dei Lutheran Church needed to replace most, but not all, of the carpet in the worship area. 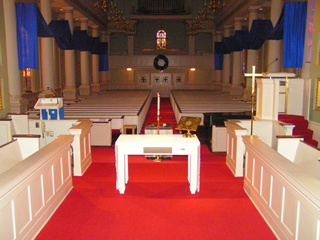 Therefore, a primary design requirement was an exact color match (Lutheran Red) to the remaining carpet around the altar. They also wanted to retain the existing baseboards without damaging them. Project Facilitator Steve Teitell stressed that durability was essential because the church wanted the carpet to remain in excellent shape for at least 15 years. Design and Product Selection: A CBL designer successfully found a color match in our large library of commercial products. Not only did it come in Lutheran Red to match the existing material, but it also had an attractive texture. The carpet was a 32 oz. solution-dyed nylon which will ensure its color fastness and durability for its expected 15-year life span. 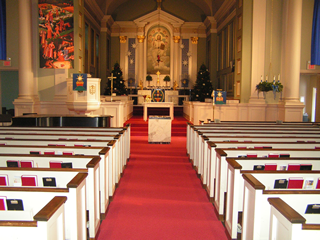 Installation: CBL’s commercial installers were meticulous with the transitions between every pew and the aisle. The carpet removal crew was also very careful not to damage the baseboards that lay on top.